We're so confident you can't find a better deal, that if you can we'll beat it. UMoveFree will beat any legitimate offer from another apartment finding service. We can even save you some time... because a better deal just doesn't exist! UMoveFree is the largest and most popular free apartment finding service in Texas. We help thousands of renters find their new apartment each and every month. Our volume allows us to offer you the most competitive Free Move and Rebate offers in the industry. Over the years several copy cat competitors have emerged, but none have come close to offering the same value. Renters that do research know UMoveFree offers the best deal backed by an industry leader with an unmatched reputation. Our free move competitors have far more restrictions and renters often find these companies demand additional fees on the day of the move that were not disclosed in advance. Our rebate competitors offer half the amount and their rebates often come in the form of a prepaid gift card that expires after 90 days! With UMoveFree you'll receive a rebate check that you can deposit or cash as you please. 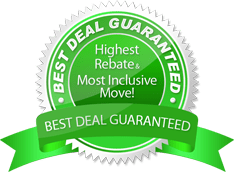 There's a reason UMoveFree is the largest free move / rebate apartment finding service in the country; we cut through the scams and the gimmicks and offer the best deal from the most reputable company... and we guarantee it! UMoveFree is not only the largest apartment finding service in Texas; we're also the most reputable. We encourage renters to check out real reviews from real customers before choosing any free move / rebate apartment finding service. Renters that do research on independent review sites choose UMoveFree every time. You'll find that UMoveFree has incredible customer satisfaction; something our competitors just can't say. Don't trust your belongings to smaller competitors with bad customer reviews. Browse hundreds of UMoveFree Reviews now. we have an A+ Better Business Bureau rating!